With these words, the world was welcomed to the Olympic games in London. Shakespeare wrote them 401 years ago in his last play, The Tempest. The play traditionally is associated with closure; Prospero, the play’s leading man, rejects his books, knowledge and his ‘art’ at the close of the story, and strives to go on without them. Perhaps The Tempest was Shakespeare’s farewell to his craft. But the monologue that opened the Olympics was not written for Prospero—it was for Caliban, Prospero’s deformed slave, a victim of Prospero’s colonization of the ‘isle,’ and a rebel of questionable morals. In his essay “Culture,” the Shakespeare scholar Stephen Greenblatt describes Caliban’s voice as that of “the displaced and oppressed.” Greenblatt lionizes Shakespeare’s “imaginative mobility,” which enabled the Bard “to display cracks in the glacial front of princely power.” He closes the essay, “If it is the task of cultural criticism to decipher the power of Prospero, it is equally its task to hear the accents of Caliban.” Certainly British culture seems more identifiable with the power of Prospero, with colonialism and monarchy. There is no doubt the 1908 and 1948 London games would have associated more closely with Prospero. The magician who could create civilization on a forgotten island would have surely seemed a preferable figurehead for a city rebuilding itself after the Second World War. In 2012, the Olympics games were bookended by Caliban’s nine lines. Two actors spoke the nine lines quoted above, one at the Opening Ceremony and the other at the Closing. It marks something of a change in British tradition to celebrate Caliban instead of Prospero, but then the past sixty-four years have seen something of change in Britain herself. We have witnessed the birth of counterculture, the celebration of irony, the knowing nod to our own weaknesses. 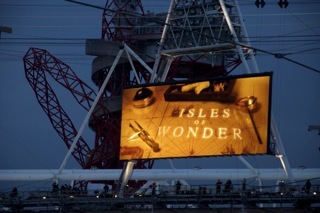 The London Olympic organizing committee understood the irony of Caliban opening the show. The ceremony proved that London is not only ready to hear and celebrate ‘the accents of Caliban’ but also that the nation is ready to show off the cracks in the glacial front of its power. For like most of the world’s glaciers, Britain’s is melting. After Beijing’s structured brilliance en masse, it was felt that London could hardly compete, on the performative as well as the economic stage. The wise decision was made to take a different tack. The best way to undermine self-importance is with irony, and it was with irony that the world watched James Bond and the Queen parachuting into the stadium, Rowan Atkinson napping alongside the London Symphony Orchestra, and, of course, Kenneth Branagh, British stage darling, dressed in a top hat and tails, declaiming the lines of a deformed former slave. The isle certainly was full of noises this summer. The endless construction, the road closings and the traffic jams, the bleating of the talking heads on the television … But that night, as the world assembled to watch the ceremony, the sweet airs replaced the hustle and hubbub. The Olympics have now ended, and in the face of the realities of global Realpolitik, we just might cry to dream again, and return to the simple competition of track and field. The troubles around us today are far more traumatic than the supposed tragic upsets on the sports field. Subjugation and discrimination are not confined to Shakespeare’s plays. In the history of the world, the Calibans rarely succeed, but perhaps the decline of British Empire provides an example. For in 2012, we saw colonialism in reverse: men and women of all nations were welcomed to London, and this time they were taking the gold.